Flo Kosicki was born in Brooklyn, NY where she would grow up and eventually meet her beloved husband Al at the young age of 16. A true "love at first sight" story, they would eventually be married a few years later and go on to enjoy and celebrate over 70 years together, 68 years married. While still in Brooklyn, Flo worked as a Customer Service Manager at Revere Copper & Brass and started a family with Al, having one son, Gary, and one daughter, JoAnn. 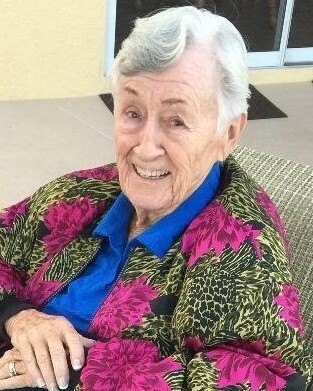 Flo and Al would later retire to Naples, FL in the early 90s to be closer to their daughter and first grandchildren, where Flo would become involved in her community of The Orchards and develop a resplendent social life. Flo is survived by her husband, Al, her two aforementioned children Gary (and wife Julia), and JoAnn (and husband Daryl), her four grandchildren: Chris, Paul, Emilie, and Lucas, and was predeceased by her third grandchild, Kevin. Flo peacefully passed on January 22 after her family was able to spend the day with her recalling stories, sharing future plans, and playing some of her and Al's favorite songs while saying their goodbyes. Mass of Christian burial will be celebrated on Monday, Jan. 28th at 11:00 a.m. in the chapel of St. Agnes Catholic Church, 7775 Vanderbilt Beach Road Ext., Naples. Inurnment will be private. Memorials in Flo's name may be made to the Alzheimer's Research Foundation, (813) 920-2922.